1. PREHEAT oven to 400°F. Unfold puff pastry sheets and roll out one sheet to about an 11-inch square and one to about a 12-inch square. 2. LINE bottom and side of greased 9-inch springform pan with 12-inch pastry sheet. 3. BEAT eggs in medium bowl with wire whisk. Reserve 1 Tbsp.egg; set aside. Add ricotta cheese, pepper sauce and spinach to eggs in bowl; mix until blended. 4. 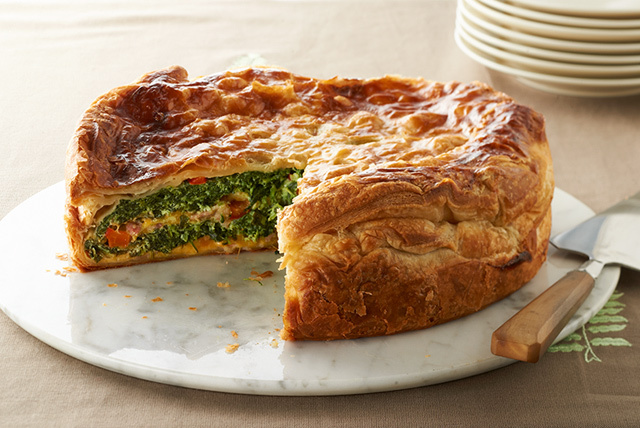 LAYER half each of the bacon, cheese, spinach mixture and red peppers in pastry-lined pan. Repeat layers. 5. PLACE remaining pastry sheet over mixture; fold and tuck pastry edges into pan to enclose filling. Pinch edges to seal. 6. BRUSH surface with reserved egg; pierce pastry several times to form vents or slits, which will allow steam to escape during baking. Bake 45 to 55 min. or until top is golden brown. Cool 10 min. Run small knife around edge of pan before removing. Makes 12 servings.